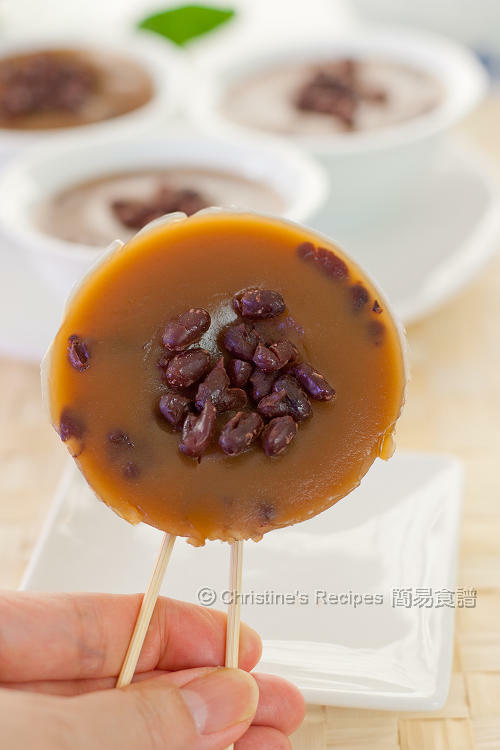 Steamed Rice Cup Cake with Red Beans is a famous street food in Hong Kong. Its chewy texture with flavours of sugar and beans are very attractive to those people who are fond of steamed desserts. It’s worth trying this classic Chinese snack if you haven’t had a chance before. Ever tried this Chinese steamed rice cup cake? Traditionally, they are cooked in small earthen bowls. In Cantonese, they are called 缽仔糕, (Bok Jai Go, literally means cakes in small bowls). So they might be translated into “bowl cake” or “bowl pudding” The Chinese character of "糕" sounds like “go” that means “pudding” or “prosperity”. 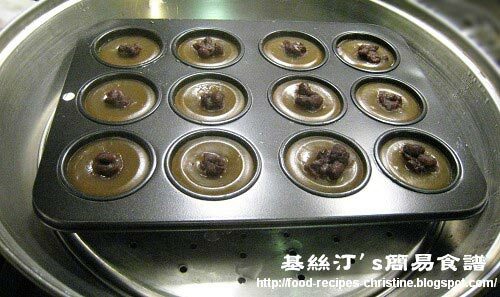 The steamed rice cup cake (aka steamed red bean pudding) is a traditional and well-known street food in Hong Kong. They usually come either in brown or white in colour, depending on whether brown sugar or white sugar is used. Many people like adding some red beans before steaming, and having it when it’s warm. Add rice flour and wheat starch into 1/2 cup of water and stir well. Use 1 1/2 cups of water to dissolve sugar over medium heat. Bring to a boil. Quickly pour into the flour mixture. Continuously stirring while pouring. Stir and combine thoroughly. Transfer mixture into a mini muffin tray (or any mould you like) to steam over high heat, about 10 minutes, in batches. In the middle of steaming, you can add some sweetened red beans on the surface of rice pudding and continue to steam until cooked through. Photo taken on Oct. 2009. Traditionally, this dessert is cooked in little bowls. If you use bowls, then cooking time will be around 20 minutes. The non-stick muffin tray I used, which is a good heat conductor, the steaming time was shorter. Remember to grease the bowls before adding flour mixture into them. Christine, these look so delicious. I have not made them yet but will have to one day. Love red bean paste. Very gd for parties. Thanks for sharing. Wow, another wonderful dish on my Christine list to try. It looks amazing and I have an incredible weakness for red beans. MMMMMMMMMMMMMMMM,...what a divine & tasty looking dish!! I've always want to try this!Looks so good! do you mean big cups or small once... ? I use the metric cup to measure for all recipes on this blog. If I'd like to add red beans before steaming, what texture should those red beans be? Boiled and soften slighly? or Red bean paste? For this recipe, the texture of red beans is up to your preference. I like the red beans just softened, and not too soggy. When you say wheat flour, do you mean like whole wheat flour? Or do you mean wheat starch? I tried this recipe and it was good. I used whole wheat flour, and it gave it a weird texture. Wheat flour and whole wheat flour are two different things. In this recipe, the "wheat flour" is “澄麵” in chinese, available at Asian stores. See the right-hand side of the second picture my previous post here. Hi Christine, your steamed rice cake looks absolutely mouth-watering. I'm going to try making these one day. PS: I found you through Kristy. I've already translated the recipe in Chinese there. Hey Christine. Is it possible to replace the brown sugar with regular granulated sugar? Will it make a difference? Yes, you can. When I was in HK, I saw there were two kinds of steamed rice cup cakes, one was brown, the other white. If you use regular granulated sugar, there won't be any big difference in taste, but the colour would be white, and lack of the sugar cane fragrance. Thank you so much Christine!! I have been searching very long for a recipe for Bok Jai Go. Your recipe is the first one that I found that looks close to what my mom used to make. She is no longer with us and we miss her many dishes/desserts. wow im super excited to try out your recipe as everyone else has raved about their success. i wanted to ask you about mixing red beans into the batter. is that possible? will it ruin the consistency of it when steaming? Yes, it would, and make the colour of the batter change. Moreover, all the red beans would sink and sit at the bottom. im having trouble converting grams to cups. approximately how many cups is 85gm of rice flour and 55 gram of wheat starch? i made the first batch but think i used too much dry ingredient cause it became really really thick and hard to mix when i added the 1/2 cup water to it. then after i steamed it, it looked kinda funny too. very grainy looking. thanks!! Yes, I also find converting gram to cup measurement is very troublesome because every ingredient is very different. There is no formula out there to use. You have to weigh the ingredient one by one. So that's why I like to use an electric kitchen scale. And it's more accurate, more quality control. Even though you have cup measurement converted, every time you use a cup to measure out the flour is not the same, for sometimes you might press or not level it enough. The difference is quite big. Would you consider investing some money to buy an electric kitchen scale? Thank you for the recipe. My only problem is that I used a bigger mould muffin tray (only 6 cakes at a time for me) and it is difficult to get them out. Try a non-stick tin or grease some oil before putting the batter in, that would help. I love this recipe but one question. The ones in Hong Kong are less harder in texture. Christine (or anyone), do you know how to make them a bit 'lighter' and more 'wobbly' if you what I mean? i wish i had read some of these comments b/c i tried to make this recipe but it was with whole wheat flour! blech, it was a mess...i'll have to look for the wheat flour starch! thank you for sharing this recipe~ I made it today for my mom (who grew up in Hong Kong) and she said it tasted pretty authentic. :) actually, I didn't have any wheat flour, so I substituted with potato starch..not sure exactly what difference it might've made, but the taste and texture were still good! Hi Chris, The first 2 times I did it was fine. Now I tried 3 times and I feel there is something wrong with it. I bought a new packet of Wheat flour which is exactly the same brand as before. Something funny happened. When I poured the hot water into the flour mixture. It become gluey and the mixture is very thick. Can you please let me know what is the problem. It seems like the flour has already cooked. Thanks for your help. Supposed that the steps you followed and ingredients you used were right and exactly the same as your first 2 times. Right? Is the flour expired or something? Could you shoot me some pictures of the wheat flour product and the process you mix the flour if you try the 4th time? Am very curious. Could you let me know if it matters whether I am using rice flour in the red bag or glutinous rice flour that comes in a green bag? Which one should i use? For making this steamed rice cake, we use rice flour that comes in the red packet, about 85grams. Rice flour and glutinous rice flour help produce very different textures. The latter will make cakes more chewy and elastic. It does matter which kind of flour we choose. In Malaysia we can get the savoury version of this steamed rice cake topped with some cooked salted vegetable. Do you have a recipe for this ?? 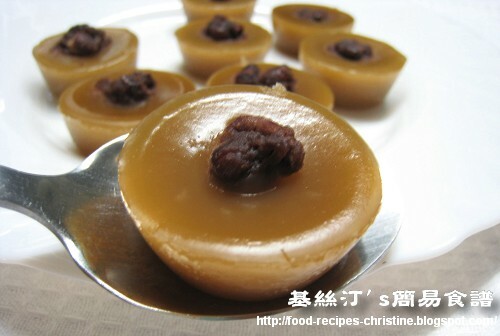 I made these today using Pearl River brand brown slab sugar but my puddings came out really pale. Which brand brown sugar did you use to get that lovely colour? I used CSR brown sugar.